Performance art is essentially a performance presented to an audience with a fine are context but can also be interdisciplinary. A performance can be scripted or orchestrated or even spontaneous. Performance art has had a role in avant-garde art throughout the 20th century, having essential roles in dadism and futurism. The main purpose of performance art is to challenge the traditional conventions of “art”. Most performance artists use their body to a great extent in performances. Performance art is not bound by time but has to have an audience to which it is directed, without the presence of an audience it simply becomes a piece of art or a performance. For instance Nikhil Chopra, a Performance artist, documented himself creating art on the street, what made it a performance art was the audience that looked at him and had an interaction with his space while he created his sketch. Nikhil Chopra is an artist that completely immerses himself in his act. Its almost always pre planned but not all of his performances are scripted. His character in the performance is extremely important and is not afraid to express his creativity in anyways going to the extent of being extremely comfortable stripping down in front of a camera or even an audience who has come to view during a performance. The entire collection is based on a depiction of historic places of Sri Lanka, and what they were used for though maps. The artist has moved away form generic ways of map making and has moved towards a more aesthetic approach moving towards a kind of an illustration. 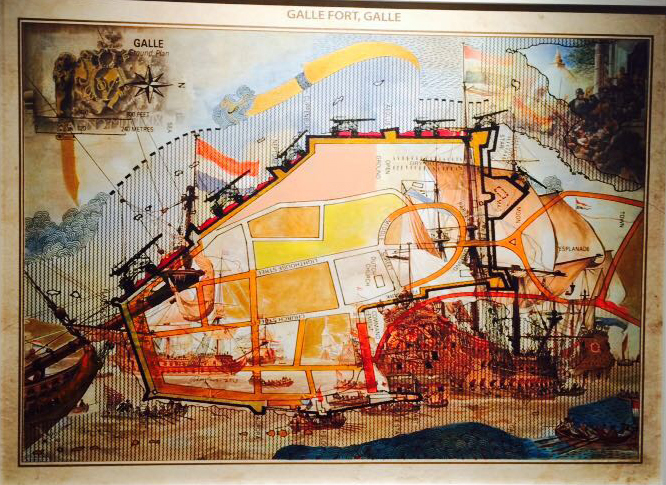 Using the example of the Illustration of the Galle Fort, one can easily tell the space in which it was located because of the illustrations around the map. It was clearly a busy port used for trade because of the depiction of a multiple ships on the sandy shore, with the sea close by. The ships or boats also have different flags, showing that the port was used to trade with number of different countries. There is a compass on the top left corner, which is a nautical symbols, re enforcing the concept of sea travel. When depth is added to a two-dimensional object “Space” is created, it is what encompasses everything around us. Space can be looked at through a number of lenses, physical, psychological, objective. Space plays an important role in a painting or an artwork. It helps the viewer get a clearer picture about what is actually happening along with it surroundings, though its dimensionality. 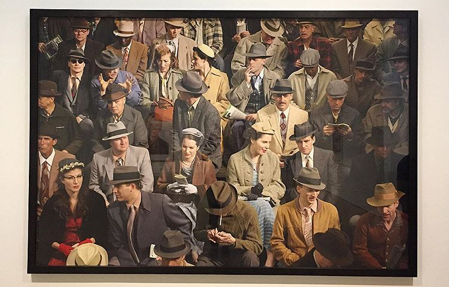 I saw this painting on social media from the Hammer Museum in LA, although I don’t know its name or the artist, this painting intrigued me. It has so much detail that it instantly gives you information about the people in its and the surroundings. It game me the impression of an English society at some kind of a match or a derby, sitting on the bleachers. The spectrum of people in the society is also captured through the painting showing that all of them are from the same social strata because of their clothes and how integrated each of them are with each other. Even though the painting literally has only humans you can easily tell so much about the space they’re in. One would think without 3D rendering in paining, gauging the space or the surroundings would not be possible. However, when there isn’t dimensionality in the paining, what exemplifies its space and surroundings are the protagonist or elements. For example, miniature paintings don’t really have rendering but we still understand the its space though the clothing, colors and paining style. Everyone gets tired of living their boring monotonous life and sometimes it just gets hard to handle. We often find ourselves in situations like this where all we need is a break or to move to an alternate universe, if you tend to be more extreme. 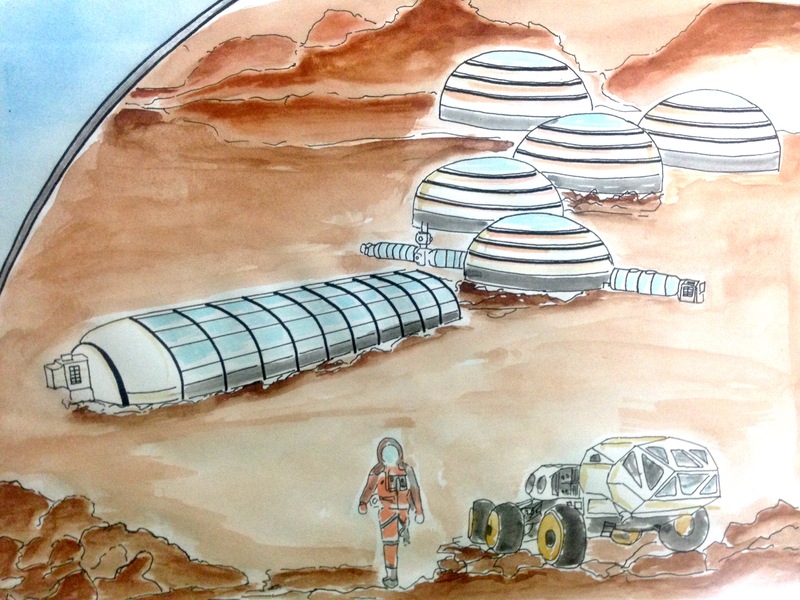 Now we know that moving to an alternate universe is a bit of a long shot, so how about settle for a weekend on Mars? A hotel inside a glass globe in the middle of nowhere created to make you feel like you’re on mars. A place covered with red sand and an excess gravitational pull mimicking the red planet. 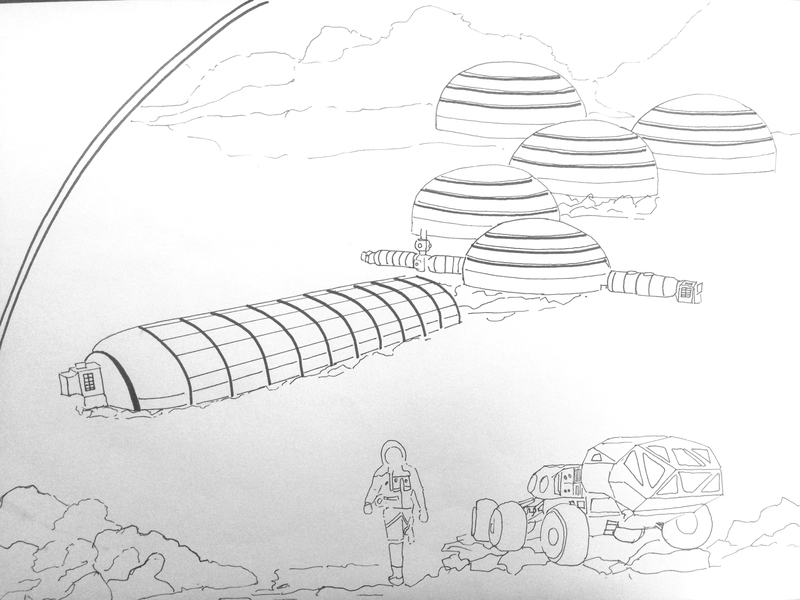 A self-sustaining resort that creates its own organic crops and where a space suit has to be worn at all times outside the living quarters. Of course it’s a place to “get away” and relax so it will have a fair share of modern facilities to make it comfortable, including the rover to take you from place to place in the resort. “Where words fail, music speaks.” -Hans Christian Andersen. Sound plays such an essential role in a film. It fundamentally sets its mood. Even though we don’t think it makes a difference, watching a movie without its music would change the experience entirely. It helps the viewer connect to the movie and its characters at a greater level. Having sound or music at a crucial part helps make the views feel what that characters are feeling. The music of a film actually helps the view get a clearer idea of the emotions felt at that moment. There is always the presence of sound and music that runs through the entire film. Most of the time we don’t even realize it but get accustomed to it at an indescribable level. Filmmakers employ various techniques to achieve the right atmosphere for instance fast music for suspense, deep music for melancholy or sharp music for intrigue. Sometimes when the words aren’t enough to translate the gravity of the situation, it’s the music that then helps accomplish those emotions. Music does more than just enhance the film; it fortifies our memory of that film to the emotions felt at that point and without its music the movie almost looses its meaning. The Grand Budapest Hotel is one such film that has used sound and music in an intriguing manner. The plot of the film is rather dark. It revolves around the murder of a wealthy woman, the theft of her priceless painting and the battle of her family over her enormous fortune. Although it has such a dark plot it falls under the comedy genre and I think it has a lot to do with its art and sound direction. This film was basically a flashback of a story in a story. The events that took place were actually in 1932 and was told to the author in 1968. After which a girl in 1985 starts reading a book where the story is penned down and is being narrated by the author from his desk, the start of the story. To me the plot didn’t really matter by the end of it as compared to the way it was made. There wasn’t one single minute in the entire 1.39 minute run time of the film that didn’t have a background sound. The background score by Alexandre Desplat features orchestral elements, keyboard instruments and balalaikas along with European melodic themes. As the film is set in the olden days, the filmmakers have employed techniques to make it look as if it was a movie from that time itself, especially with the music. Like any old film the sets look as if they’re actually sets and aren’t real, probably made of paper. The music is extremely stereotypical, for instance when they’re running there is a fast beat, when something suspicious is happening there is a slow beat. When there is a romantic gesture there are heavy but soothing vocals. What also made it interesting is in between scenes there was cartoonish music and at some parts I almost felt like I was watching a Charlie Chaplin movie. Through out the score there was a lot of string music, enumerating the generation at the time the movie was set. For me the dialogues were overpowered by the background score and without this kind of sound direction I feel like the movie would have almost no meaning. It was like the sound was explaining the picture. Sometimes music creates its own language, speech beyond human speech. But when human speech is put into a melody, the music becomes the dialogue. This is exactly what musicals are. The musical I thought was the most appropriate is Mamma Mia, adapted from the WestEnd and the Broadway musical. The beauty of Mamma Mia is how so perfectly the plot has been created to fit the ABBA songs in it, it almost seems as if the songs were written for the movie. Its like most of the dialogues are the songs essentially. This movie is set on a Greek island, about a young bride to be, Sophie who wants to be given away by her father (who she has never met). But she doesn’t know who it is and has 3 possibilities and so she invites them all for her wedding without telling her mother of course hoping to find out who her real father is. What Sophie sings while posting the letters. It shows what she desires without really saying it as a dialogue. I feel like it is easier to express ones true emotions in song rather than a dialogue and so every song in this movie helps one understand what each character is essentially made of and what he or she feels. This is when Donnas 3 olden day love interests arrive, Sophie’s possible fathers. This is at Sophie’s bachelorette and when her three possible fathers tell her they want to give her away separately. Also place where the sound cannot be isolated, while the song is going on there is a parallel conversation between Sophie and her fathers. This way the plot thickens and the lyrics of the songs replace the dialogues and really help you get into each and every character so effortlessly. In this movie the plot is essentially the music and so without the music there would be no movie. “Love isn’t something we invented. It’s observable, powerful, it has to mean something… Love is the one thing we’re capable of perceiving that transcends dimensions of time and space”. Interstellar by Christopher Nolan was one movie that made me feel butterflies in my stomach. The basic plot of the film is about finding a new planet for the survival of the human race. It was very thought provoking to see how time is warped in space and how that would affect human life and what isolation can do to a person. Along with the expedition they raised many questions about the human race it self and the emotional connect to one another and how no matter what those feelings transcend through time and space. It really made me question my existence and the fundamental idea of life and time even though it was a fiction movie. It may not have been real life, but it showed what life really means. The movie seemed so real, as if this was actually happening. I have to admit I didn’t understand everything, but with all filmmaking techniques put together I could feel every emotion that was intended to be felt. Hans Zimmer has exceedingly well created a background score that makes you feel the vastness of the universe, which was oddly comforting to me. Through the movie there is always that supernatural background undertone, which gave a constant eerie feeling. There is also a sacrificial and honorable feeling that comes out through the tunes of the score. What made it so interesting to me are the parts where you could feel the silence and loneliness, when you can here the most distant sounds. It is these distant sounds that builds the tension in the film. The parts where the spacecraft is shown form the outside, that is space, there is remote silence as no sound travels in space, which adds to the feeling of limitlessness and enormity. It kind of transposed me to a different space of heightened emotions in the duration of the film. I’m sure the movie would not have been so successful without the clever induction background score. There are many such techniques employed by filmmakers in different genres to bring about different emotions within the viewer changing the movie watching experience entirely. The concept of music has been around since the medieval times. It’s an art form whose medium is sound. Every kind of music has had to have a folk background and then gone through an evolutionary passage. There are now a number of different genres of music like pop, rock, trance, folk, punk, instrumental and so on. Over the years music has changed to so much that each genre now has a specific characteristic. The feeling I get when I listen to say rock is miles apart from when I listen to trance. To be honest I feel the music you enjoy is very situational, the kind of atmosphere you’re in or even the people you’re with. I’m sure no one would want to go for an EDM concert with his or her parents. EDM or Trance owes its recognition in India to Goa of course. It began around the hippie time as a rebellious movement. To understand trance one must understand the ideology it came from. The hippies believed in being free and in a “heightened state of consciousness”. It was the time when the philosophy of drugs and sexuality cultivated and therefore till today people believe that trance is synonymous with drugs and Goa in India. Whenever a person says Goa you instantly think; great new music, raging parties, cheap alcohol and drugs, the beaches, see food and culture comes much later. Goa is now the party city of India. People seem to think Goa is the place to experience EDM concerts for obvious reasons, but it doesn’t seem that obvious to me. Do you really have to be in an intoxicated state to enjoy trance music? Or is it just a thing you have to do because everyone around you seems to feel that way. Even if you don’t really know what you want you know that Goa is the place to be if you want to “enjoy trance”. Concerts are a comparatively new craze in Mumbai. Over the last few years there have been a number of EDM concerts with artist like Afrojack, Steve Aoki, Sweedish House Mafia, Hardwell and many others, which have all been sold out for the simple reason that it’s a concert and so you have to go for it. Even if you don’t really like or even know the artist you have to go for it because its a concert. Everyone always cribs about no big names apart form EDM artists come to Mumbai and then promise themselves “no more EDM concerts” but the next thing you know you’re booking your tickets for the next Sunburn Mumbai. It’s not about being hypocritical, it’s about wanting to be part of something, standing with hundreds of people and having a good time. At least you claim to be having a good time. These concerts have a rather large target audience now with teenagers from the age of 15 up go to have a “good time”. Everyone goes through the concert phase where you just can’t miss even one concert and then you just grow out of it. Sweedish House Mafia was once concert that was so excessively overhyped where every single person you knew had to be there. I have to agree it was a great concert, I remember having a blast. Just standing there and chanting the words to “Don’t you worry child” along with entire audience feeling like you’re apart of something big. I actually think that marked the beginning of the craze of EDM concerts in Mumbai. Over the last two years I went for many concerts; Steve aoki, Avicii, Hardwell but all these were long ago, which just means that I invariably out grew these concerts with absolutely no regret. Many people still think of trance as noise, some are captivated by the sound of the beats and some “need to be high to enjoy it”. I see validity in it to a certain extent; music cannot just be made out of the blue. It needs inspiration and emotional connection otherwise what is produced would truly just be noise. Even if I say I don’t like trance when I’m in that kind of an atmosphere where everyone is happy I would enjoy it too. I feel like lyrical music has a lot to do with what you think about it and what you interpret it as. The satisfaction and euphoria arises from your mind itself. But I believe trance speaks to your body. I believe that, if you can feel the beats of the music thumping within your heart and body it is successful, other wise its just commotion. The Bollywood culture too has started inducing a sense of trance into a few of their songs, such as Dum Maro Dum and Manali Trance. Although both of these stick to the stereotypical ideology of Trance where everyone is intoxicated or high in the music video. It’s so thought provoking how trance from the western world influenced Goa and then go on to influence Bollywood music. The Cholas were one of the longest ruling dynasties in the history of southern India form; they came into power in the late 9th century and stayed in power until the late 13th century. During this period art, literature and religion flourished. The Cholas were Hinduism believers and the rise of other religions didn’t shake their faith. The Cholas were greatly known for their bronze sculptures. These sculptures were created so that they could be carried out of the temples and used daily in temple festivities and rituals. On many of these statues holes were found on the base, which were said to be used to carry them during the rituals. The sculptures would be heavily decorated with jewelry. Hindus believe Shiva appears in this form at the end of the cosmic cycle and in the beginning of the next one and therefore associated with creation and destruction. Through the pose he seems to be peaceful yet in his dance pose yet in a ring of fire symbolizing destruction. 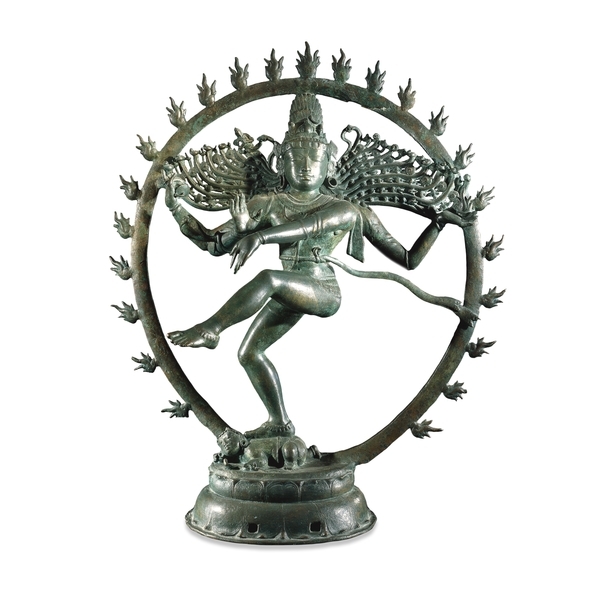 Shiva is most likely preforming the tandava in this sculpture, his dance style. The figure seems to have a rather expressionless face, probably trying to strike a balance between the creative and destructive nature. It’s said that in his wild hair that extends towards the sides during his dance, rests the goddess Ganga. Which is a personification of the holy river that was said to have streamed out of his hair showing him in the form of a creator. Along with the Ganga there are crescent moons in his hair, which as associated with his wild nature therefore his destructive form. He also tramples over the Hindu mythological creature “Apasmara”, the dwarf of ignorance. In Hindu mythology Lord Shiva is said to maintain the cosmic cycle, of creation, preservation and dissolution. Tandava is lord Shiva’s sacred dance that fuels this cosmic cycle. While dancing this vigorous dance form he is called Nataraj, the Dancing God. Tandava depicts Nataraj’s violent nature as the destroyer of the universe. Along with symbolizing creation and destruction, the Tandava also shows the daily rhythm of birth and death. Some beilive that there are seven types of Tandavs, each performed with different emotions. Andnda Tandava depicts him enjoying, Rudra Tandava depicts his violent nature. However these are the main forms of the Tandava, the others include, Tripura Tandava, Sandhya Tandava, Samara Tandava, Kaali Tandava, Uma Tandava and Gauri Tandava. The Tandava is the sacred dance- dram of southern India, performed to appease Lord Shiva and recognize the cosmic cycle. The Tandava has energetic and sharp movements making it an extremely hard dance to perform. Tandava is performed by Lord Shiva and in response to his vigorous dance, Parvati, his wife preforms the Lasya. Lasya is just the opposite of Tandava, with gentle and graceful movements. Its also sometimes called the feminine version of Tandava.